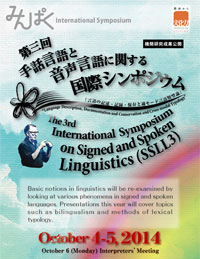 The 3rd International Symposium on Signed and Spoken Language Linguistics (SSLL3) "Language Description, Documentation and Conservation and Cross-modal Typology"
Core Research Project "Anthropological Studies of Materiality"
Basic notions in linguistics will be re-examined by looking at various phenomena in signed and spoken languages. Presentations this year will cover topics such as bilingualism and methods of lexical typology. With Live Streaming on Ustream! A staff member will be at the main gate of the Natural and Cultural Park (near Banpaku-Kinen-Koen Station) from 8:30 - 9:30 in the morning. To enter, please present the proof of registration that will be sent to you when you register. Please send the following information either by e-mail or regular mail: Your name, address, phone or fax number, e-mail address, Deaf or hearing, sign language requirement (if you are a signer), the date(s) you are interested in participating. Reception for presenters on October 4 will be open to the general public (for the fee of 4,000 yen). If you are interested, please indicate so when you register. Please write "International Symposium registration" in the subject line. Please send the following information with a return envelop with stamps to: Office of Prof. Kikusawa, National Museum of Ethnology, 10-1 Senri Expopark, Suita-shi, Osaka, 565-8511. English captioning service will be provided on internet; please bring your own mobile device (laptop PC, iPad, etc.) to access Wi-Fi.